The new Golden State Warriors’ arena, Chase Center, embraces its host city. Landscape architecture firm SWA to create vital, publicly accessible realm in former industrial zone. Whether they have game tickets or not, visitors are invited to stroll up a grand staircase to take in spectacular views of the Bay, enjoy a picnic lunch, visit the many retail and dining outlets, or meet friends for an alfresco movie. Many sports venues in American cities flicker to life on game nights yet otherwise operate as fortresses from their neighborhoods. Upending that tradition is the new Golden State Warriors’ arena, Chase Center, which embraces its host city by anchoring San Francisco’s new Sports and Entertainment District. Designers at SWA sought to create an inviting destination there by providing flexible plazas equivalent to a series of outdoor living rooms. “Flexible spaces are the key to our strategy for remaking and animating the site,” explains SWA Principal Justin Winters. Custom-designed planters/seating modules are deployed throughout the various plazas to frame different events. The modules can be moved by forklift to create spaces for ice skating, farmers’ markets, an instant micro-garden, or a car show. They can also aid in traffic flow. In fulfilling San Francisco’s strict codes for water run-off, designers created a special terraced garden along 3rd Street. The garden offers a learning experience in revealing the bio-filtration process by which plants help to cleanse all water on site. Native California planting throughout the ten-acre parcel of land conserves water, provides shade canopy, and unifies the area’s character. 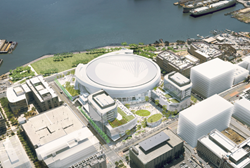 Given the large scale of arena projects, Winters suggests that other locations around the world could benefit greatly from San Francisco’s example of strict codes for treating water runoff. SWA’s efforts are expected to be completed in 2020. To the east of the Warriors’ arena, a waterfront park is being planned and designed with the hope of opening around the same time as the Chase Center.